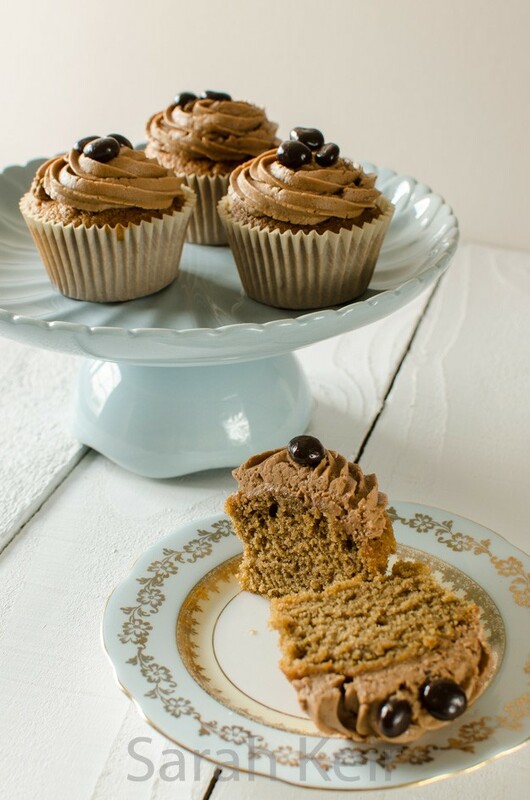 I have shied away from putting up a recipe for cupcakes so far as they seem to have had their time in the spot-light and are now considered ‘has beens’. I think this is rather harsh as a good cupcake is a lesson in portion control; no guessing how many the cake is supposed to feed and trying to gauge slice sizes. The key though is a GOOD cupcake. Far too often have I been tempted by the bling exterior of a coffee shop or market stall cupcake, just to be sorely disappointed by the dry, tasteless, overly sweet interior with far too much sweet, tasteless icing. 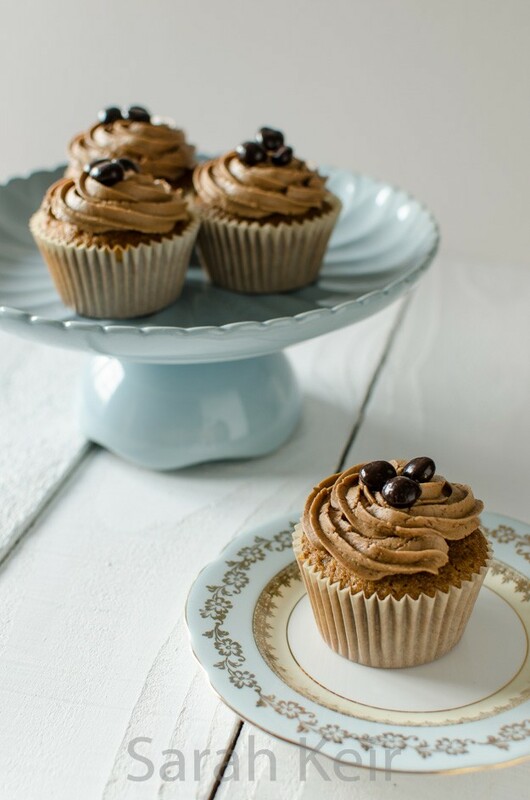 Coffee cupcakes with coffee flavoured Swiss meringue buttercream and decorated with chocolate covered coffee beans. But cupcakes do not need to be like this. For cupcakes to be a joy they must be freshly baked (no more than 24 hours old or they are too dry), as they come out of the oven liberally brush the top with appropriately flavoured sugar syrup, consider filling the centre with jam or fruit curd and consider the icing to be in proportion with the cake below (Swiss meringue buttercream is luxuriant but not too sweet). My favourite cupcakes that I make are a lemon sponge, doused with lemon syrup as they come out of the oven and then filled with lemon curd and topped with lemon cream cheese topping (half cream cheese, half butter, sweetened with a little icing sugar). Decorations should be simple but appropriate and are not the entire reason for a cupcakes existence. Go on, give cupcakes a second chance. 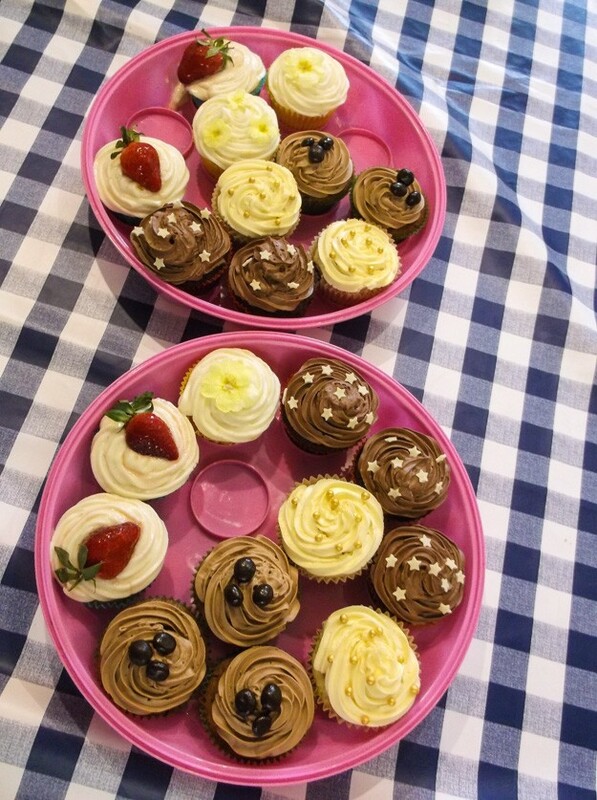 Selection of different cupcakes I made for charity fund raising – lemon, strawberry, chocolate, coffee and almond amaretto. Preheat the oven to 180ºC/160ºC fan. Put cupcake cases into hollows of a cupcake tin. Put the butter/margarine into a large bowl with the sugar and cream together until light and fluffy. Add all the other ingredients in one go and beat on slow speed until mixed thoroughly and a smooth, thick batter is formed. I prefer to do the last bit by hand with a silicone spatula so that all the ingredients from the sides and bottom are thoroughly mixed in and the batter is not over mixed. Divide the batter between the cupcake cases – should come three-quarters full. Bake for 18-20 minutes, turning half way through cooking. Take out the oven and allow to cool for at least 15-20 minutes in the tin before turning out; this stops the paper cases pulling away from the cake. Prick the tops all over with a skewer and use a pastry brush to soak in sugar syrup. Sugar syrup – 5 tablespoons of water plus 75g sugar – place in a small pan and heat gently until the sugar is dissolved then allow to cool. Add flavourings – a split vanilla pod or for lemon replace the water with lemon juice. Will last up to a month in a sealed container in the fridge.